There was a time when people use to keep their passwords in an encrypted vault with some password managers available. However, now the scenario has changed you have options to sync and keep them conveniently at a local location. You can also change passwords in a click, login to websites and much more. Today we will be sharing six best password manager in the market. Our criterion of choosing the best password managers is flexibility for a single device with little web or no web components at all and also to sync across all devices. All password managers should have high security, audit for some passwords that are same for too many places. Most of them will improve safety across the web, and they also protect your data that is stored in a single location. Although there are many password managers, we have chosen only the six best password managers that are not in any particular order. 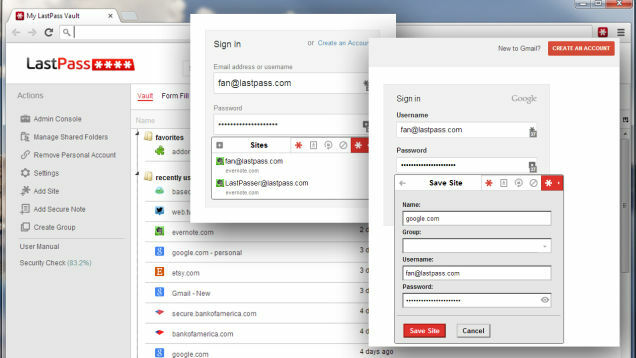 Lastpass has numerous authentication options and has a great user interface that has been designed lately. It is free for users on desktop and has a reputation for being on top of all password managers. Many of the reviews online has pointed Lastpass as the best choice for managing passwords. This password manager has an added advantage of biometric authentications. It looks basic in its interface but has lots of potential when it comes to securing your passwords. With newly added contact feature, changing passwords automatically, and the secure sharing has made this new Dashlane a favorite one for many. With the several advanced feature of obtaining passwords, Dashlane has made it easy to shop online with ease. KeepPass is not only free but it has a great portable app that can be used from machine to machine. The passwords in KeepPass are stored in a database that’s encrypted and controlled by you. Some of the features of KeepPass are 3rd party plugins, access with multiple keys, autotype facility for all browsers and windows. The name Norton has been there for a while now and since many years Norton Identity date has not changed anything. Although it is a good option and if it gets updated frequently compared to the other password managers on the list it can be used by masses.. If it regularly makes updates to its features and UI, Norton will be a top player in managing passwords. RoboForm is another powerful yet well-maintained password manager, it also has form-filling data and can work on many PCs at one time. You can also access its data online with it. So, how did you like our selection of best password managers? Do tell us which one have you used before and which are new to you. We are always looking for feedbacks from you.